Japanese (JIS X 201) mapped katakana characters. 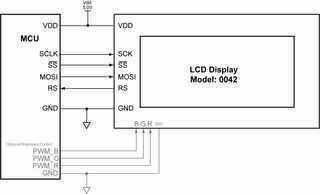 "Display data and status with your microcontroller!" Black text on a silver reflective background. No backlight. 1 row of 8 large characters. 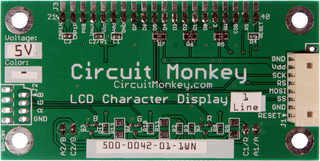 Circuit Monkey model 0042 is a SPI compatible LCD character display based on the Electronic Assembly DOG-M series and available as a RobiCon.org compliant module. 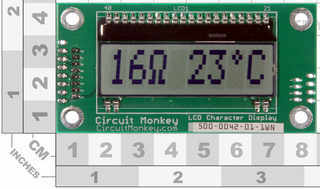 The display module is available in three (row x characters) formats, 1x8, 2x16 and 3x16. 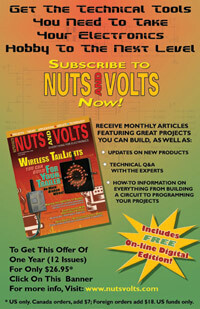 The module operates at 5V but can be customized to run at 3.3V. 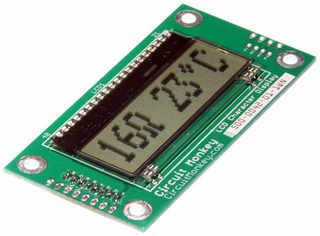 This 40mm High x 80mm Wide module is suitable for professional and reliable integration into panels, cabinets, chassis and other off-the-shelf enclosures. The connector is a Molex Micro-Blade friction lock type and is designed for use in appliances and commercial equipment.